True to form, Microsoft is leaning its considerable weight to make sure you never forget Surface. The company’s new commercial for the nifty Windows tablet shines on the many features that make professional productive. At the core of that productivity is Microsoft Office and video conferencing. Office is what differentiates Surface from all the other tablets out there and it is a good move of Microsoft to remind everyone of that fact. We all know that Microsoft is embarking on a new strategy by playing in the same field as the OEMs that maintain the company’s dominance in the operating system front. How the Surface will fare against other Window RT tablets, like the Asus VivoTab RT, remains to be seen. Great ad! It convinces me more to get one! Gee, I miss all the kids dancing around. It was all that dancing that was going to convince me to get this product. Too bad most people aren't productive. They fiddle with there iPad then run to their PC for other things. With the surface, you don't have to do that anymore. This they don't understand. I wanted to buy a surface 64gb but not at ipad prices. $200 less and it would be a deal. Customs and VAT really doubles the price of gadgets especially since our government killed the special waiver for educational electronics. Put it in perspective... With the waiver I imported two $2k alienware laptops for just $50 each. Now the cost is fixed at 27%. When it's all said and done you could actually buy the same product TWICE! I would jump at a $500 64gb surface RT!!! I don't think, MS can convince people with these ads to buy surface. Only best part of surface is it runs W8 and everything else is terrible - 1. Price - If google can sell Nexus10 for $400 with way better specs, why can't MS...greedy! 2. CPU - Tegra3 @ 1.3Ghz is not going to hold on with higher work loads (Per Anand, CPU spikes are consistent when working on Office). 3. Display - 1366x768...really? for $500 tablet!!! 4. Shape - Whats wrong with MS...surface looks terrible in portrait mode. 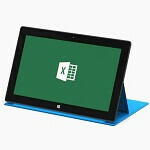 MS should price surface at $300 for people to even think about cross shopping!!! 1) The only better spec is the screen resolution. Per your point 3, the resolution really is the only knock on the Surface. That said it is actually pretty sharp compared to similar resolution screens, though upon close examination doesn't hold up to Nexus 10 or retna Ipads. As for the price, Google sells at very tight margins or an operating loss and makes it up in Play store sales. MS took Apple's approach of making profit on each device. Since their store will be playing catchup for the next 6 months to a year, they can't play the loss leader game yet. 2) It's the same processor as every high end Android tablet and comparable to the iPad. If that's your complaint you should feel the same about every other tablet out there, and buy a laptop. 3) I too was hoping for a higher resolution, but in person the clarity is better than the number suggests. Can still display 720p movies at full resolution, but Nexus 10 and iPad are better for photo editing. 4) You don't like rectangular tablets? Would you prefer Dwight Schrute's triangle tablet? I have played with Win RT numerous times and had no issues with portrait mode in the Metro interface. True, in desktop mode it looks odd, but desktop mode is only there to placate folks who dont want to leave it behind. There has never been a good "portrait" mode for the old school windows desktop, and I doubt there ever will be by nature of the interface. So if you want portrait mode, use it in Metro apps. Works like a charm, and the tiles and info re-position neatly. 1. So you forgot, it has Exynos5? 2. I am not sure what you know about tegra...Surface use T30 model...other high end Android tablets use T33 model. 3. Display resolution does matter...a lot. Tablets are used at close proximity compared to notebooks or laptops. 4. Yes I do like rectangular tablets in 16:10 aspect ratio. Anyway...I was very keen to buy Surface...but Anand has clearly mentioned in his review to hold on till haswell based i5 is used in surface pro...so here I am...waiting again! I'm gonna bring up the fact that Google makes $0 off of the tablet. They make their money from the services they offer. Microsoft is selling the tablet, and the software. I love my surface. I'm ready for my next semester. Got all my textbooks as ebooks and Office for RT is awesome. I also love the ability to plug it into any printer and just press print and it works. I would love scanner support, hopefully that will come in an update soon and I'm hoping for a torrent application but for right now I am using teamviewer to access my home computer from my surface so i can store files to my cloud and get it on my surface and using utorrent remote to keep an eye on my downloads. I have the 32gb version with a 16gb flash drive and it works extremely well. Love my Surface and while I don't use it in portrait all the often, it is not the killer that other note. With the wide-screen resolution it is obvious they were gunning for media that fits the bill there. And it is the productivity and connect ability that makes the difference. Too bad the iPad users have to dock theirs to a PC or Mac. The USB port instantly supported my wireless headphones, mouse, drives, etc. With the Type Cover and my wireless mouse, with 1/3 the weight and 3 times the battery life I can still access my Office docs through Skydrive, upload content, and I haven't even scratched the surface of a MicroSD card yet. While the Surface Pro will be a huge step, the RT is still a far more productive tablet than the iPad than previous tablets, and it is completely integrated with my PC at home, networked drives, printers and other PCs in the Homegroup right out of the box. With that noted, MS does fail in one marketing regard. When I chose my 64GB Surface, it came with a black Touch Cover. It would have been logical to either offer a $500 option wo/cover to allow me to customize with a color cover, or market the 64 and 32GB models with different cover options. I did purchase the Type Cover as well, and it is super. I didn't mind typing on the other, but the type cover makes this a slim, expandable RT notebook.